After 8 years, 227 blog posts and almost 140,000 reads, I'm moving to a new blogging home! I have started work on LynseyGarrick.com, a proper website and everything! I thought it was about time I really invested in my writing and I want to connect with other bloggers/events/brands on a more professional level. I will still occasionally post here to remind you where to find me, but for now, bye bye Blogspot! When you lose a baby, you're not just losing the child, you're losing the future you'd planned for them. You'll never hear them say, Mummy, you'll never take them to their first day at school, attend their graduation or give them away at their wedding. All the hopes and dreams that you had imagined for your child and yourself as a parent, disappear. So today, on what should have been James' due date (14/07/2018), I wanted to write about what James has achieved. He may have only lived for 23 weeks and 5 days, all of which were inside me, but James has done so much. When we announced we were pregnant, our loved ones were incredibly excited and when we lost James, they were devastated. We were inundated with cards, gifts and flowers. as beautiful and thoughtful as this was, if people wanted to spend money on us, we wanted it to mean something. We requested that people donated to The Butterfly Suite at Southend University Hospital, the bereavement apartment where we had James. So far, over £1465 has been raised in James' name. From now on every Christmas and on his Birthday, Mike, our families, and I will continue to support this wonderful place and future bereaved parents. 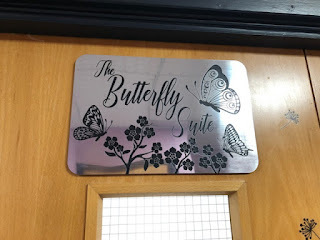 The Butterfly Suite and the sign Mike made for them. After 12 years, two houses, 1 wedding and countless drama in between, Mike and I were happy and solid in our relationship. But losing James has strengthed us as a couple. 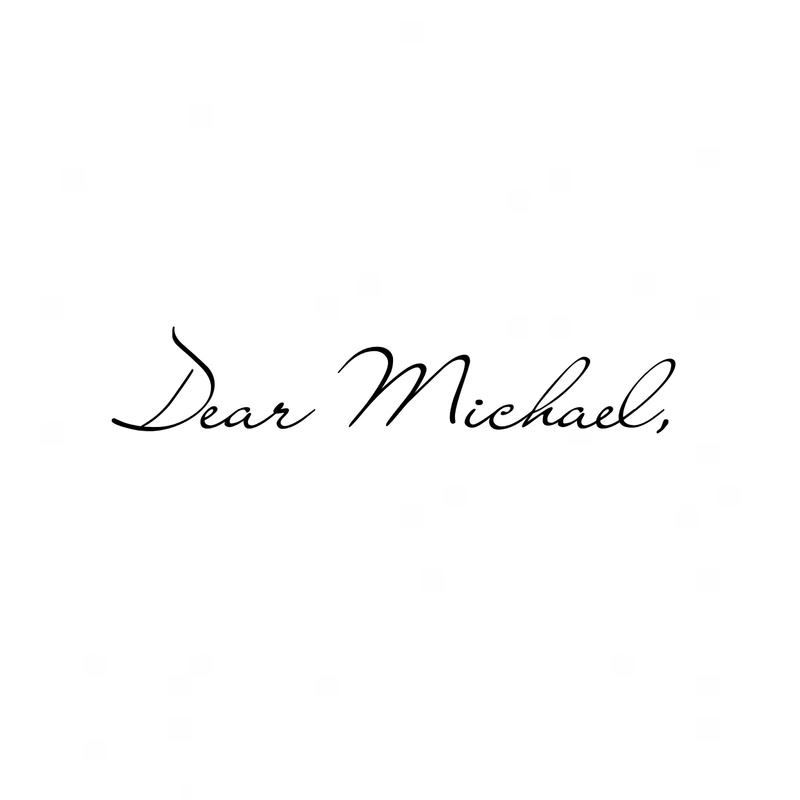 I've seen a new sensitive and open side to Michael (read more about that here) and now we talk about everything, no matter how hard. James has bought his Mummy and Daddy close together, ready to be awesome parents to his future siblings. 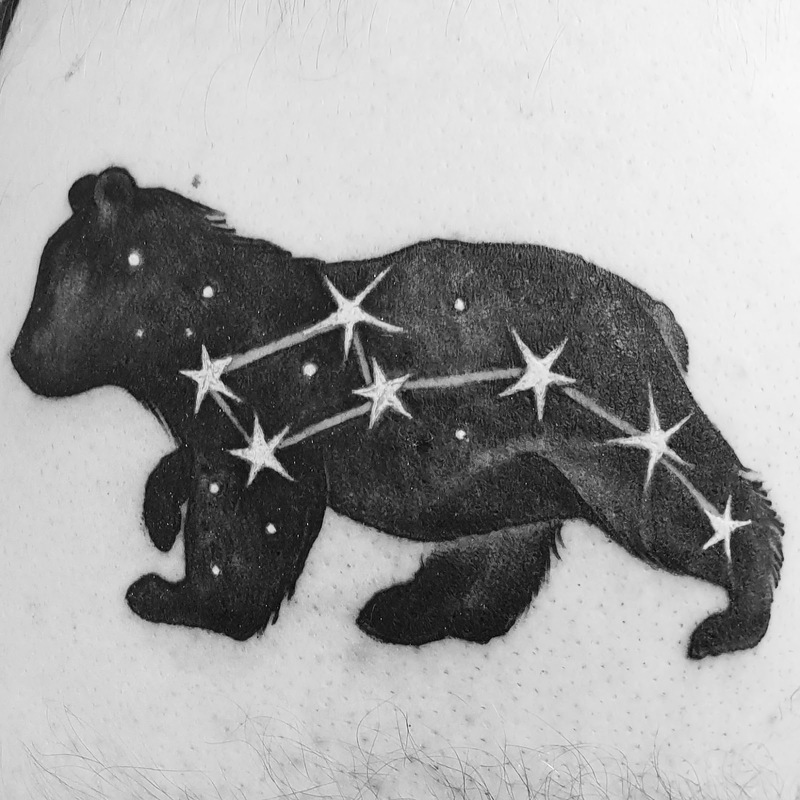 Mike is scared of needles, but he wanted to get a tattoo in memoriam of his boy, so he did. A beautiful bear with the Ursa Minor constellation on his belly (where we've bought a star dedicated to James) and I will today, have a go at doing Instagram stories -something I keep putting off! We are being brave, because we've been through so much, we now feel like warriors. I've always been a glass half full kind of girl, this natural optimism was rocked when we lost James, my glass just felt empty. As the weeks have gone by, I've started to feel more like my old self. Of course, I'll never be the same, but my love for life has begun to return and I now appreciate Mike, my family, friends, my home and even my questionable health much more. We all have stressful lives, there is always a to-do list on the go, another commitment to add to the diary and a bill to pay, but now that, in my opinion, I have experienced one of the worst things a human can go through, I am a lot less stressed. I take all the small irritants of life with a pinch of optimistic salt. James has saved me from a lifetime of worrying over the small stuff. I have a lot of wonderful friends and didn't need any more but in my grief, I sought out to meet and read about those who could completely understand what child loss feels like and those that could guide me through this hard and painful road. Hashtag_Emma - Honest, funny and rapidly becoming a close friend! TheLegacyofLeo - The founder of Twitters #BabylossHour (Every Tuesday 8pm) and an advocate for LGBTBabyloss issues - a real leader. Ben_and_Breaking_the_Silence - A ballsy mum on a mission to get people talking about child loss and creating a universal symbol and term Vilomah (Latin for "Against the Natural Order"). One_Missing_Mum - Relatable, authentic and sweet. HannahPontillo - Style, strength and substance all in one account. ForFrancesca - A proud and straight talking Scot, one to watch for health inspo too. Even though we would give anything to have James back, celebrating his health and happy entry into the world today, I have to give thanks for the things James has achieved and given us. Whenever and however a woman gives birth, she is changed whether it has a good or bad outcome. No doubt James' passing will continue to teach Mike and I hard lessons, but I am proud of our boy - our first born and true love but I'm also proud of us. It's Fathers Day, sadly not a happy one. Without our James here with us, our arms are empty, but you are still a Father. You became a Father on November 4th 2017, the day we took the pregnancy test. You'd reluctantly gone to the pharmacy, as I'd been feeling sick for 10 days, you thought I was just being a hypochondriac and psychosomatically wishing I had morning sickness, but those two pink lines proved us wrong. For weeks afterwards, I would catch you grinning to yourself, or I'd see you looking at other Fathers and their children and occasionally suggesting baby names whilst reading ending credits of a TV show. James' pregnancy was difficult, from the medical detox to the severe sickness and the pain. You would work a 10 hour day, come home, cook, clean and then work on your art projects, whilst I took to the sofa - scared to move. You were a star and never complained. When we went to scans, you would involuntarily grab my hand and we'd grin like fools, I could physically see you falling in love with James. As my tummy grew and my symptoms subsided we started to plan the nursery, we bought a Moses basket, discussed breast pumps and researched birthing plans, none of it phased you, I knew you were more than ready to be a Daddy. On the fateful day we found out we would lose James, as our hearts broke in unison, I knew in that moment how much you loved both James and I, by how much pain you were in. When James was born, I was highly medicated but the memory of you holding our boy, stroking his face, tears streaming down yours whilst your Dad, James' Grandad, rested a supportive hand on your shoulder - will stay with me forever. The process of losing James took its toll on us, but only strengthened our relationship, you became more open, emotional and honest, after 12 years together I didn't think I could know you any better, but you becoming a Father just made me more proud and in awe of you. In the 2 and half months since James was born, you've had to go back to work, but it hasn't stopped you caring for me. When you arrive home and I've barely managed to do more than shower and cry, you don't tut or become annoyed, you always ask "What can I do?" and sit and hold me as I sob... and that's all I need. You do this all whilst grieving yourself, you've been so strong. I cannot thank you enough. One day, you will be a Father of a living baby, he or she will never replace our first born, but losing him as made me realised, now more than ever, how much I want children with you. If we can come out of all this heartache, stronger and more solid, then I think anything else life throws at us will be a doddle and I'm so glad it's you by my side. So have this Fathers day with your own Father, yes it will be sad, yes there will be someone missing but let's hope that by next Fathers day it will be a happy nappy filled one. Lynsey Ellard. Picture Window theme. Powered by Blogger.